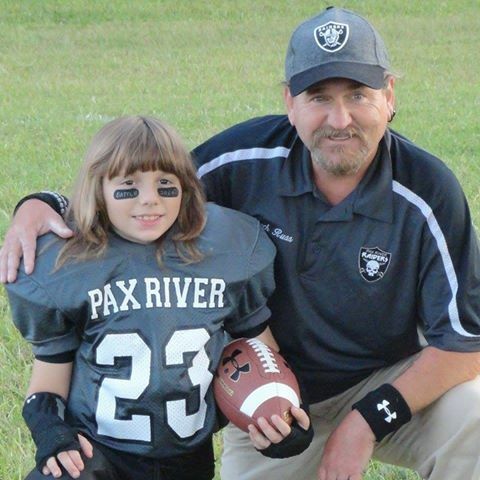 Russ Cole | Pax River Raiders Youth Football League Inc. It is with great sadness that we must announce the passing of one of our coaches Russ Cole. Coach Russ made a huge impact in many young lives across the county in his various coaching roles and touched each and everyone’s heart within the Raiders. From day one as a Super Tiny Mite assistant coach, he instilled in the boys that it wasn't just about winning, he focused on teaching his players the fundamentals of football and showing the kids that in order to succeed as a team they must function as a family on and off the field. He always told the kids “the more you practice and give it your all the better you will be as a player”. He demonstrated this by always giving 110% to his team. During his time with the Raiders, Coach Russ brought countless kids from other sports to the organization through his love for football and the love for “his boys”. His many players included his son Jaxson “Battle Jax” Cole and our honorary water boy Liam. Some of his many accomplishments with the Raiders included receiving the NYSCA Coach of the Year award for 2012 and leading the 8U JR team as a first year head coach to and undefeated season including winning the SMYAC Super Bowl in 2014.Coach Russ was a huge part of the Raiders Organization and you could always find him either at concessions flipping burgers, holding chains, filming games, and cheering fellow Raiders teams to victory! There was never an off season for Coach Russ, he lived for the game and this passion alone was passed along to everyone he came in contact with. Coach Russ extended his arms to the Raiders and adopted us all as family. It was nothing after a game for him to take a few players home to hang out with his boys. Coach Russ touched more hearts than he ever realized and will truly be missed. On behalf of the Pax River Raiders to include all football players, cheerleaders, coaches and parents we would like to send our sincerest condolences to the Cole family, especially his sons Noah, Liam, and Jaxson. Please keep the Cole’s in your thoughts and prayers during this difficult time.